More and more home gardeners are growing plants for food. Ornamental trees and shrubs are being replaced with dwarf fruit trees or berry bushes. Fruit bearing plants have blossoms in the spring, followed by mid- to late summer or fall fruit, and some even have beautiful fall color. They can be a beautiful and useful addition to the landscape. However, fruit bearing plants can be susceptible to pests and diseases that ornamentals are not bothered by. 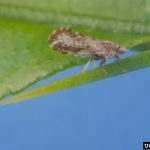 Citrus trees can be infected by Asian citrus psyllids, apple trees can be attacked by twig-cutter weevils, and stone fruit trees can be infected by brown rot. 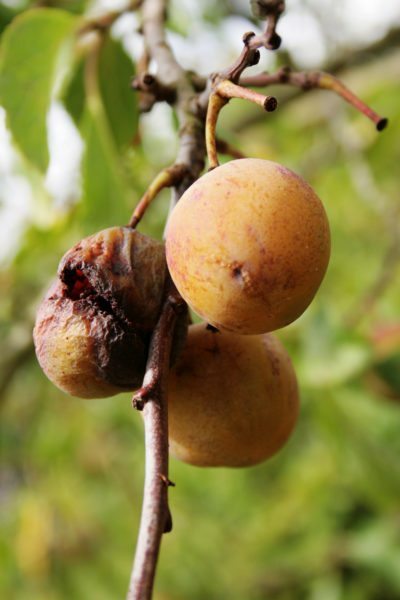 In this article, we’ll take a closer look at brown rot plum tree disease. Wet, humid weather plays a factor in the growth and spread of Monilinia fructicola. Humidity and temperatures between 65-77 degrees F. (18-25 C.) provide the disease with the perfect growing conditions. In spring, spores of the disease are released from last year’s mummified fruits or cankers and carried in the wind. When these spores land on any wet surface of a stone fruit tree, it can infect the whole tree within 5 hours. Young fruits are more resistant but become more susceptible as they mature. Brown rot of plum trees can totally rot and mummify a fruit in just two days. 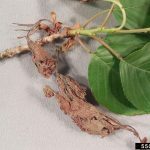 Brown rot can survive over winter, protected in the mummified fruits or cankers on the branches. In spring, when humidity and temperatures are just right, the spores are released and the infection cycle continues. Therefore, the best steps you can take in controlling brown rot in plums is prevention. Select varieties that are more resistant to brown rot. Plant stone fruit trees in a well-draining, open and airy location in full sun. Inspect and prune stone fruit trees regularly, removing any suspicious looking limbs, flowers or fruit. Prune any crowded or crossing branches to keep the tree’s canopy open to airflow and sunlight. Thin out crowded fruit, as fruits that are touching or rubbing can quickly spread the disease. Keep the area around stone fruit trees clean and free of debris. Dispose of any fallen fruit clippings immediately to reduce the risk of re-infection. 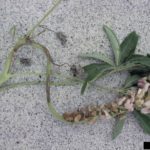 Remove and dispose of all infected flowers, fruit or branches. Spray entire fruit tree thoroughly with a fungicide like lime sulfur, chlorothalonil, captan, thiophanate methyl or myclobutanil. If there are reports of brown rot on plums in your area or your stone fruit tree has suffered from it in the past, you can spray it with a fungicide preventatively every spring just as the flowers begin to bud.